Any good film critic/historian worth his salt tries to experience as many movies of all kinds as humanly possible. One simply can't write intelligently about Martin Scorsese's Taxi Driver (1976) without an awareness of the influences of John Ford's seminal John Wayne Western The Searchers (1956), for instance, just as The Right Stuff (1983) is essentially a brilliant reworking of another Ford-Wayne film, The Man Who Shot Liberty Valance (1962). And how can one even begin to understand the entire filmography of Quentin Tarantino without first seeing the spaghetti Westerns, Euro-war movies, Yakuza thrillers, and Jack Hill-directed Blaxploitation pictures that so inform his oeuvre? I had long considered myself something of an authority of classic film comedy. Over the years I've watched and re-watched (and re-watched) practically every surviving feature and short by Chaplin, Keaton, Harold Lloyd, Harry Langdon, Laurel & Hardy, the Marx Bros., W.C. Fields, et al. I've read dozens upon dozens of books about them and the genre they inhabit. And yet, though I'd seen scads of Mack Sennett-produced silent and early-talkie comedies through the years, as well as excerpts from others in Robert Youngson's popular compilation films of the 1950s and ‘60s (1957's The Golden Age of Comedy, for example), none of this quite prepared me for The Mack Sennett Collection, Vol. One, a new Blu-ray set of 50 digitally restored classic films, which also includes two feature films: Down on the Farm (1920) and The Extra Girl (1923). I quickly realized just how woefully incomplete my education had been, and how also, until now, I hadn't been able to put Sennett's achievements into proper context. Among other things, this incredible three-disc set obliterates in the best (and most satisfyingly funny) sense all preconceived notions of this silent pioneer's legacy. Few dispute his legacy as one of the two great producers of silent era comedy, the other being Hal Roach, whose own company is best remembered for the peak years of Laurel & Hardy and "Our Gang." Roach's studio gave up making short subjects at about the same time Sennett did, but where Roach expanded into feature film production and, later, into television, Sennett was more or less forced into retirement after 1935. Soon after, newer Hollywood movies began acknowledging Sennett's innovative slapstick, in well-meaning "tributes" such as Hollywood Cavalcade (1939), Abbott and Costello Meet the Keystone Cops (1955), and Blake Edwards's The Great Race (1965). But, arguably, these films did more harm than good to Sennett's reputation. They perpetuated the notion that his talents were limited to the broadest, more frenetic of slapstick, personified by those famous Keystone Cops and their wild, stunt- and gag-filled chases across the early Los Angeles landscape, and the pie-throwing melees that climaxed other Sennett films. As this Flicker Alley presentation makes plain, Mack Sennett (1880-1960) and the various film companies he worked for - Pathé, Paramount, Educational, and his own Keystone and Mack Sennett Comedies Corp. - made a far more expansive range of screen comedy than is generally known. Yes, he helped rising talent like Chaplin, Langdon (toward whom Sennett allowed a kind of humor quite different from the Sennett house style), and others who'd moved on to bigger and better things, but he also nurtured his own amazing if less remembered reparatory company of comedians (Mack Swain, Louise Fazenda, Ben Turpin, Billy Bevan, Chester Conklin, etc. ), writers, and directors. Some of these names faded with the coming of sound (or died prematurely), while others continued on long after Sennett's retirement, sometimes for decades in other movie genres. For instance, I had known the Scottish comic Andy Clyde primarily as Hopalong Cassidy's sidekick, California Carlson, in dozens of that B-Western series' ‘40s entries. I had for decades heard about Clyde's long tenure starring in two-reel comedies at Columbia Pictures, where he worked longer and more prolifically than any other comedians there except for the Three Stooges, but until recently those comedies were practically impossible to see. And yet, he turns up again and again in the Sennett comedies, where his incredible versatility and skill at makeup demonstrated he could and did play everything from oily young cads to crotchety old men (a specialty, which Clyde started playing while still in his late twenties). The set also makes clear just how far Sennett's influence reached. After Sennett was forced into retirement, actors like Andy Clyde drifted over to other comedy factories; in the later silent and early talkie period it was often to Sennett's main rival, Roach, and later many of them ended up at Columbia with some, like Clyde, toiling there into the mid-1950s. Fans of the Three Stooges will be startled at just how direct a link there is between Mack Sennett's shorts of the teens and ‘20s and the Three Stooges films of the 1940s and ‘50s. The set wisely samples Sennett's filmography chronologically and pretty much touches upon his entire career save for the last shorts he directed at Educational, at least one of which, Keaton's The Timid Young Man (1935), is available elsewhere on Blu-ray. Sennett was born in Danville Quebec, and originally had aspirations to become an opera singer and/or actor of the legitimate stage. The earliest film of the set, The Curtain Pole (1909), in fact is a D. W. Griffith movie written by and starring Sennett. That's followed by two more American Biograph productions, The Manicure Lady (1911) and A Dash Through the Clouds (1912), the first directed by and starring Sennett, the second directed again by Sennett but starring Sennett's first great discovery, the infinitely talented comedienne Mabel Normand. The first disc mainly chronicles Sennett's rise through 1917 and the beginnings of so many silent comedy greats: Roscoe "Fatty" Arbuckle, Charlie Chaplin, Charley Chase, and, early in her career, Gloria Swanson. Included are such treasures as A Thief Catcher, a long-lost Keystone Cops one-reeler rediscovered by historian and disc producer Paul E. Gierucki in 2010, which features a heretofore unconfirmed appearance by Chaplin as one of the Cops. Disc 2 kicks off with a four-film look at Louise Fazenda, a comedienne I confess to knowing until now primarily for her mostly uninteresting sound era appearances, in movies like The Show of Shows, Alice in Wonderland (1933), and the notoriously bad Swing Your Lady (1938), her penultimate film. Little did I realize how charmingly funny she was in movies like Down on the Farm (1920), an early rural comedy with Fazenda playing a simple farmer's daughter pursued by lascivious landlord James Finlayson, who in this delightful comedy holds the family's mortgage. In addition to the better known The Extra Girl with Mabel Normand, Disc 2 introduces many viewers to more obscure but impressively talented comics such as Charlie Murray (also the director of the silent The Wizard of Oz), Billy Bevan, and Sid Smith. Disc 3 is a kind of catchall of Sennett's later career, silent and early talkie shorts starring Bevan, the great Harry Langdon, cross-eyed Ben Turpin, and Carole Lombard in an early role, among others. The Bluffer (1930) is a fascinating Andy Clyde "Brevity" (one-reeler) made in two-color Technicolor. Two of the best films in Sennett's W.C. Fields series, the awesomely dirty pre-Code The Dentist (1932) and the surreally hilarious The Fatal Glass of Beer (1933) feature better prints of those than I've ever seen, and Don't Play Bridge with Your Wife (1933) hints at the direction of Sennett's other talkies. 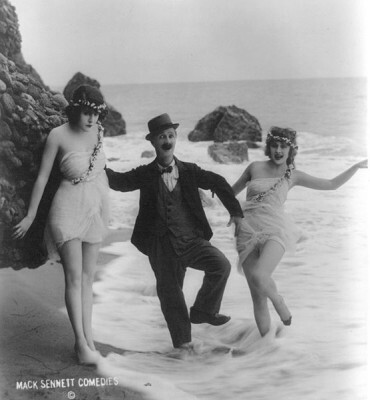 For their age and, in some cases, extreme rarity, the shorts and two features in The Mack Sennett Collection, Vol. One look great, some restored by CineMuseum and Keystone Films using the original (highly unstable and flammable) nitrate camera negatives, in their original 1.33:1 aspect ratio (with rounded corners). Others are derived from surviving prints housed at the Library of Congress, the Museum of Modern Art, the Academy of Motion Picture Arts and Sciences, Blackhawk Films, Lobster Films, the Richard M. Roberts Collection, Gierucki Studios, and dozens of private collections, with Richard M. Roberts's name appearing most prominently. In some cases, it's obvious the films were restored using multiple sources. All of the films feature strong and complimentary musical scores composed and performed by one of the following: Phillip Carli, Ben Model, Dennis Scott, Andrew Simpson, and Donald Sosin. The discs themselves are region-free. Twenty-one of the films rate commentary tracks by silent film authorities such as Brent Walker, Steve Massa, Richard M. Roberts, Stan Taffel, Sam Gill, and Paul Gierucki. Those I listened to were packed with good observations and detailed history, identifying even background players, filming locations, and the methodologies of how these films were researched and recovered. A 27-page booklet notes each title's producing company, running times, release date, director and cast, a synopsis sometimes with production notes, and the source of each master. Other supplements include silent outtakes and studio rushes (9 minutes), footage of Sennett's Edendale studio exterior as it existed in 1920, a trailer for The Crossroads of New York, The Sennett Story by Joe Adamson, an episode of radio's Texaco Star Theater called "Mack Sennett on the Air" as well as an excerpt from The Lawrence Welk Show, footage and outtakes of Sennett's 70th birthday party and a 1941 dedication of the Mabel Normand soundstage, and brief outtakes of a 1962 Keystone Cops reunion. The best extra is saved for last. In 1954, Laurel & Hardy were ambushed by the producers of This Is Your Life, the live proto-reality show hosted by Ralph Edwards. On that infamous program there were numerous technical gliches, mostly uninspired surprise guests, and Laurel & Hardy themselves hardly said a word and Stan especially resented appearing on the show more or less against his will. This Blu-ray set offers an entirely different experience with Mack Sennett's appearance on the program earlier that same year. Contrastingly, Sennett is positively delighted by the surprise, appearing genuinely shocked and humbled by all the fuss. Several big-name but earnestly effusive colleagues turn up: Louise Fazenda is among those saying he taught her everything she knows about comedy. Harold Lloyd offers a warm tribute, and iconic character actor Franklin Pangborn all but breaks down in tears. Throughout the program there's a running gag, a man being chased around the stage every so often by the Keystone Cops. Finally, the actors playing them are introduced. The man being chased is the great comedy director Del Lord (remembered today for his innumerable Three Stooges shorts). The cops: a by-this-time nearly blind Vernon Dent in Ford Sterling's old part, with Heinie Conklin, Hank Mann, and an appropriately unrecognizable Andy Clyde taking up the rear. (Even Sennett didn't recognize him.) Many This Is Your Life episodes are sappily sentimental or even creepy (e.g., the Frances Farmer show) but, occasionally, the show could be extremely touching, even moving. After gorging on Mack Sennett for the last 10 days and watching this at the end I could understand the great, bittersweet significance of that mini-reunion. Roach's studio was nicknamed "The Lot of Fun." I guess there must have in fact been two. This is an amazing set, one of the best Blu-ray releases of the year, and a DVD Talk Collector Series title.